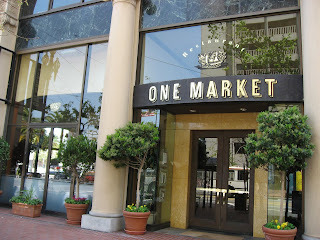 One Market opened in San Francisco in 1994 with a lot of fanfare and well-known chef Bradley Ogden at the helm. Then the restaurant went through a period of lows as chefs changed frequently. However, since Chef Mark Dommen took over in 2004, things have looked up, culminating in a coveted Michelin star last year. Incidentally, Mark began his career under Hubert Keller of the Fleur de Lys, one of my personal favorites in San Francisco fine dining. Featuring floor to ceiling windows, an exhibition kitchen and a large bar area, One Market is just a short walk across The Embarcadero from the Ferry Building. Chef Mark Dommen has a seasonally changing menu that includes several inventive farm-fresh dishes. I chose the prix fixe 'winter menu'. 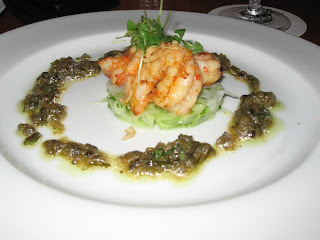 The first course was Sauteed wild Gulf shrimp on a bed of cucumber, daikon and green chile vinaigrette. The shrimp was fresh, crunchy and tasted really good with the vinaigrette. The next course was a choice between duck and scallops. I chose the pan-seared day boat Scallops. Again fresh and tasty but the portions were too large for me. 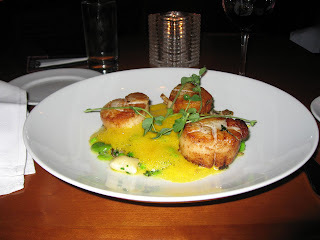 The scallops were placed on an orange foam that tasted of curry and contained fresh, tender green peas, sprouts and butter beans. 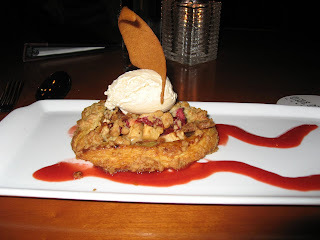 Dessert was a warm apple rhubarb galette with strawberry-rhubarb caramel and vanilla bean ice-cream. I ended up scooping out the fruit and ice-cream and leaving the rest. The food here is fresh, simple and lives up to its reputation, but neighbouring Boulevard is warmer and livelier in ambiance, and would be my choice if asked to choose between the two. Located just across the Ferry Building, this is also a good choice for lunch after a stroll through the Farmers' Market on the weekends. Haven't seen that Market before - thanks for taking us with and with interesting information too! nice post..often a good restaurant loses out as attrition comes in ..
That food looks good. Seafood is the best! @backpakker: Especially so when you depend upon the name of a celebrity chef.